Please note that items in the clearance sale may be slightly blemished or marked. Items purchased from this section are non-refundable or non-exchangeable. 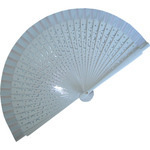 Plain Ivory Fabric Fan with Dark Pink Organza Bows - SPECIAL OFFER! Carved Wooden Fans - Assorted Colours SPECIAL OFFER!